Can you believe it's November 1st already? That means today is all about a brand new Farm Fresh Challenge at The Greeting Farm! 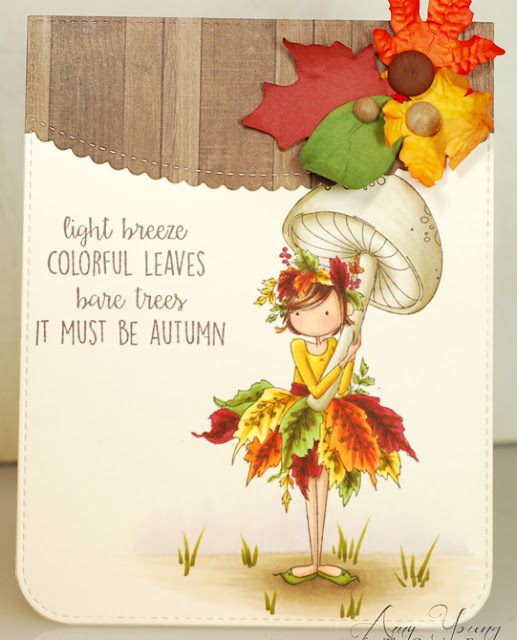 As you know, a new challenge is issued at the beginning of every month over on the TGF blog and this time around it is... 'Fall Colors'. All I had to do was take a peek out the window to spy the gorgeous red, gold and russet hues for inspiration. And with such a wide open challenge you can choose any number of the fabulous stamps from the TGF store to create a fall colored project! Playing along just might win you a $50 gift certificate! 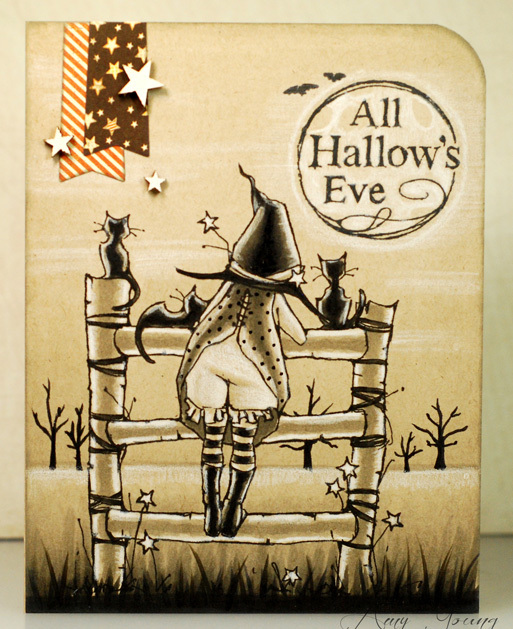 Well here we are at Halloween weekend already, sheesh... where did the month go? I really wanted to get another Roberto's Rascals on a card before the holiday was long gone and this time I inked up the li'l skeleton from the Creepy Crawlies set. He looks so happy and excited for the big day just dreaming about all the goodies to be had. I paired Mr. 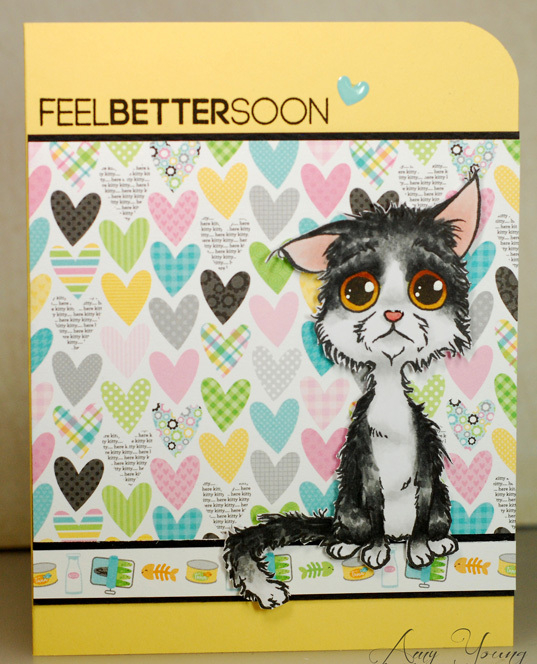 Bone Jangles up with paper and washi tape from the Doodlebug Boos and Brews collection. I really love this eyeball paper and think it gives the card a haunted house party kind of vibe. Ok, time for me to get ready for the day. I’ve got a sweet Halloween card to share with you today. 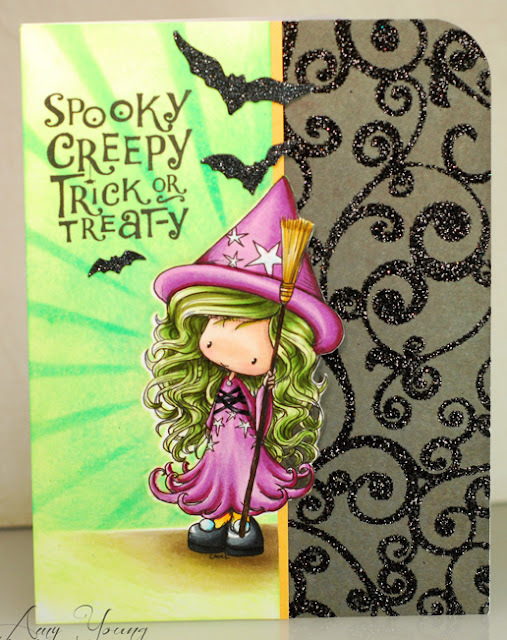 There are certainly many fantastic Halloween stamps and digis to be found in the TGF store but it can be just as much fun to take a character that wasn’t intended for the holiday and transform them into a terrific trick or treater. 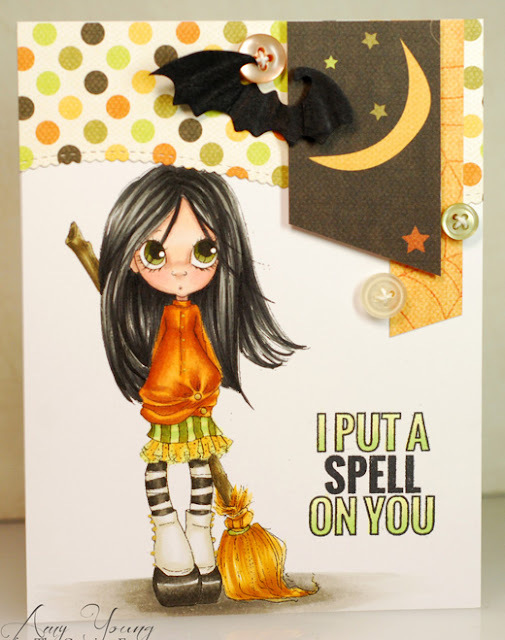 That’s what I did with little Joni from the Hatter Bean kit. 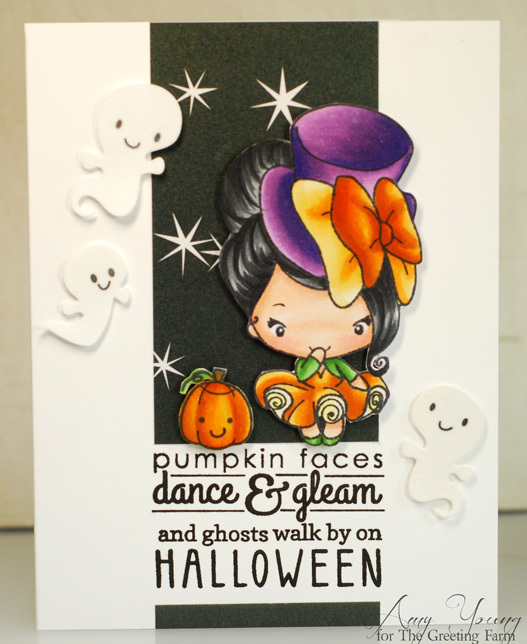 The over-the-top costumes of these quirky Beans, with their top hats and exaggerated adornments, make them super easy to color into Halloween cuties. 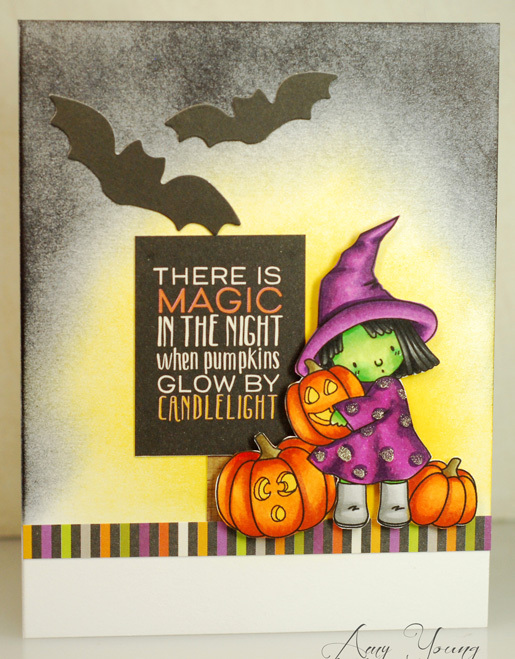 I then added the happy pumpkin from the Peek a Boo set so that Joni would have a friend to keep her company, plus I liked how it tied in to the sentiment that I chose for the card. 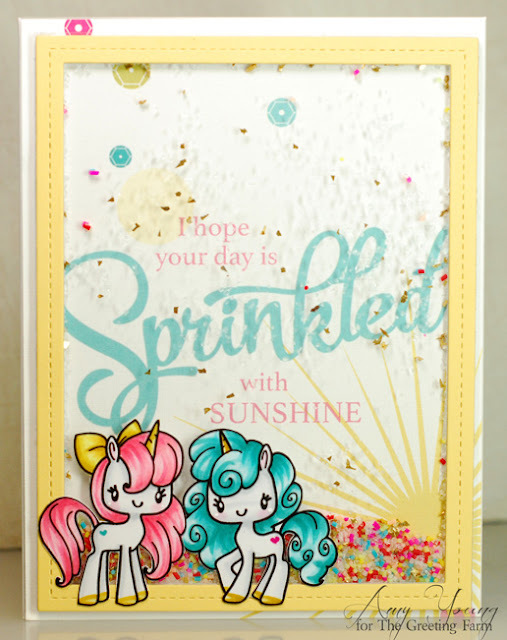 I also cut the strip of pattern paper to the same width as the sentiment to keep the design nice and tight down the center of the card. Ok, hope your week is off to a great start! I am running way behind already this morning so I am totally posting this on the fly. 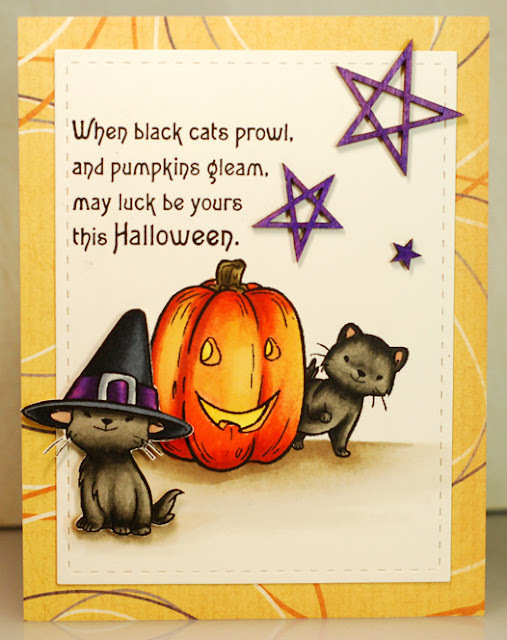 These two cute Halloween kitties are from Impronte d'Autore and I really fell in love with them because they remind me of the Sister Stamps cat stamps that I still miss so much. I don't know if it is the same artist behind both companies but either way these sweet stamps have stolen this crazy cat lady's heart. 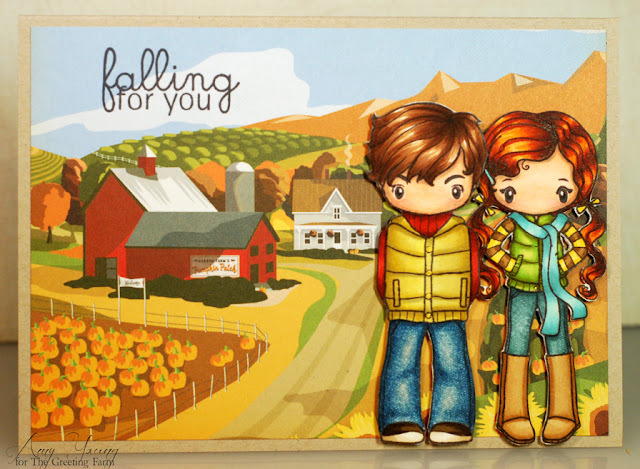 Sure, it's another CAS card from me but I didn't want to distract too much from the little scene that I had created. Ok then, time for me to scoot. Have a good one! Alrighty, busy day ahead... talk at'cha later! How sweet are the Roberto's Rascals tots? 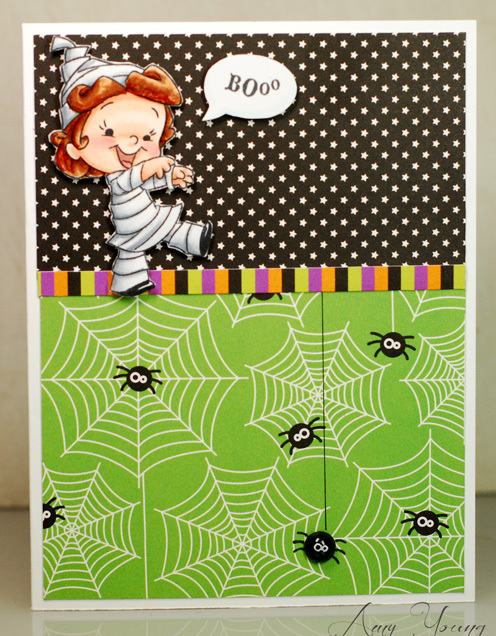 I recently got my hands on the Halloween stamps and this adorable mummy is from the Monster Mash set. She was really quick to color up and since I stuck with a CAS card base the whole thing was done in under an hour. You can't beat that when crafty time is limited. 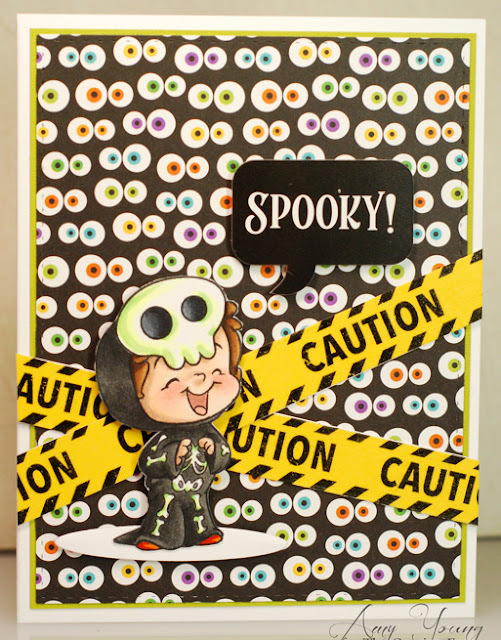 She paired up perfectly with some older Doodlebug paper because they are just as bright and happy as this fun trick or treater is. 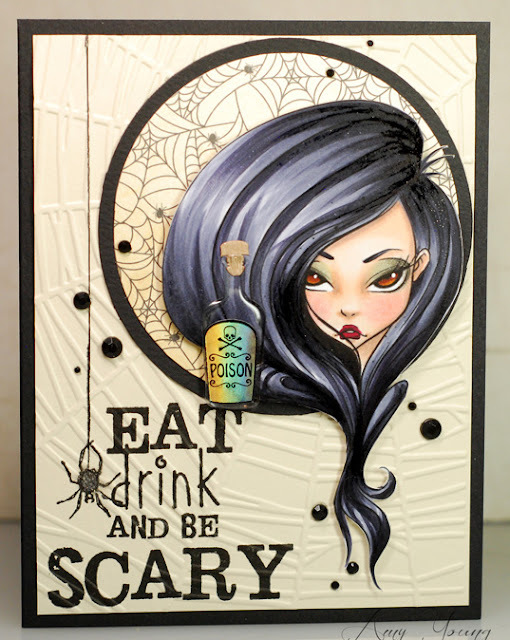 For a different embellishment I painted eyes on a large pearl then drew in legs so that it matched the quirky spiders from the paper. Well, time for me to scoot my boot. Ok then, thanks for stopping by and I shall see ya manana! Anywho, early day of work for me today so I should get moving. 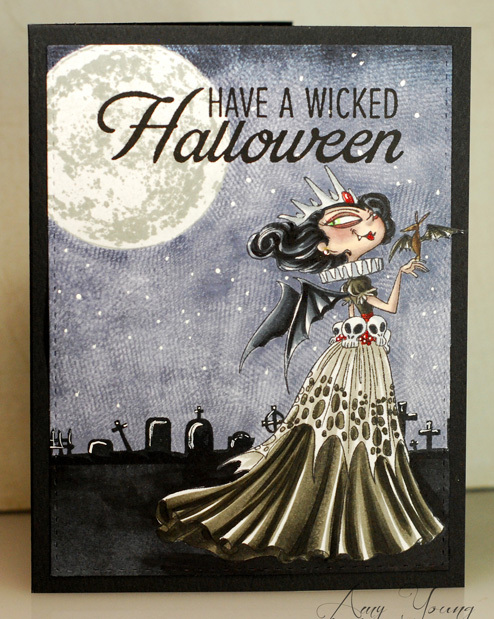 Some Odd Girl is celebrating all this month with a fun Oddtober Fest full of challenges scavenger hunts and other activities. This past weekend they issued three Facebook challenges to kick it all off and I made this card for the Odd Family challenge. The theme is to pick an image that reminds you of a family member and make a card with it. 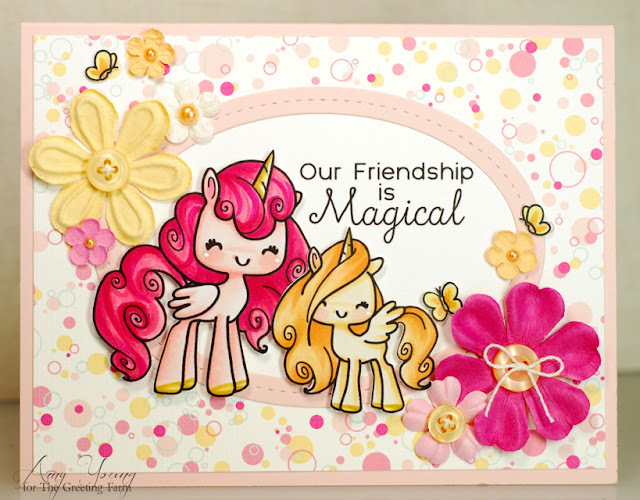 So I sat down and flipped through my collection of SOG stamps until I came across this one called Girlfriends Kaylee and Mae. Kaylee with her short hair and Mae with her long hair kinda reminded me of my sister Jacque and myself... perfect! 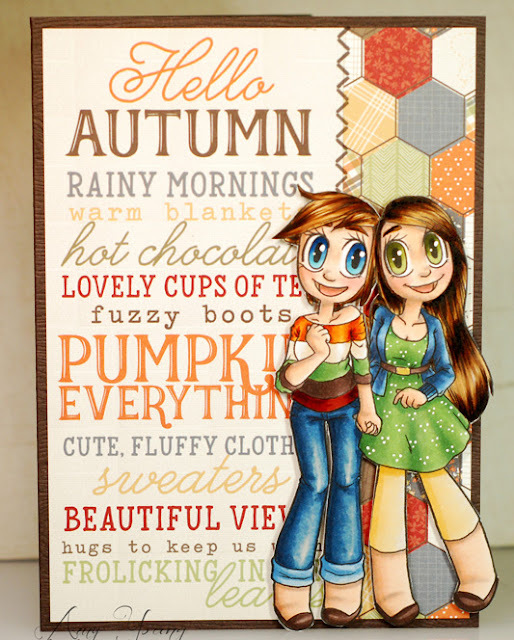 So instead of friends I've made them sisters and paired these two up with some pretty papers from the Simple Stories Hello Fall collection and not much else. I love how it looks like they are posing in front of a big reader board extolling all the best parts of the season. 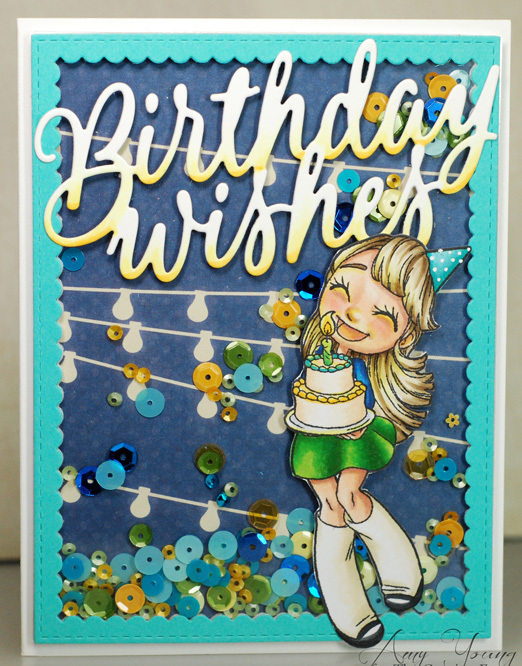 Hopefully I'll be able to get a couple more cards done before the deadline. 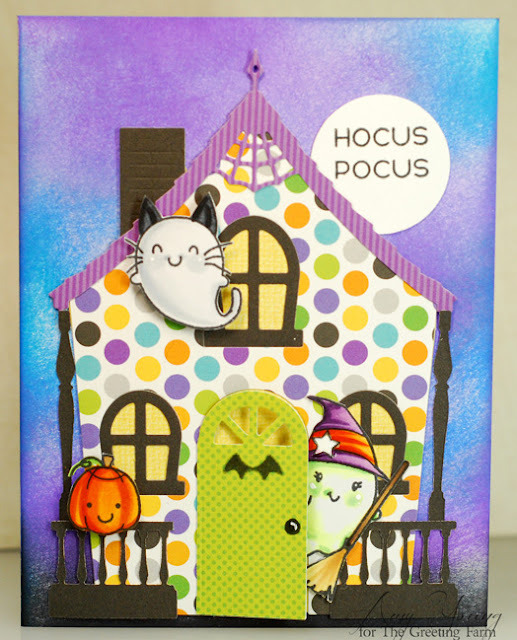 This weekend was a real whirlwind of activity so I didn't even step into the crafty room once. But it's all good because I've had this cute little ghostie waiting in the wings for a few weeks now. 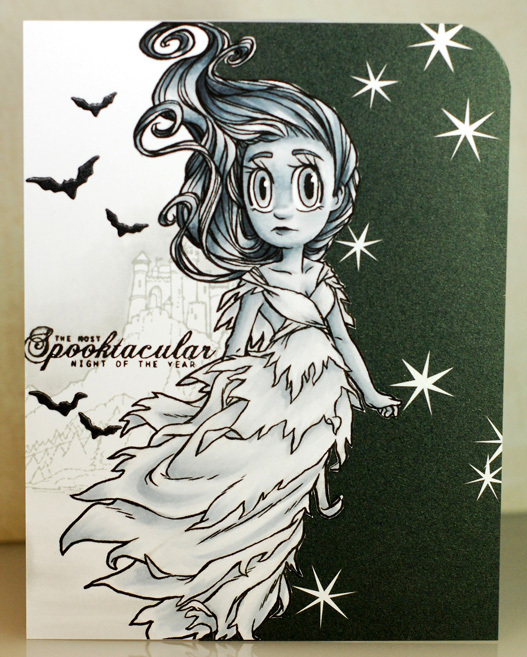 Have you ever seen a princess ghost before? I sure haven't but boy is she adorable. 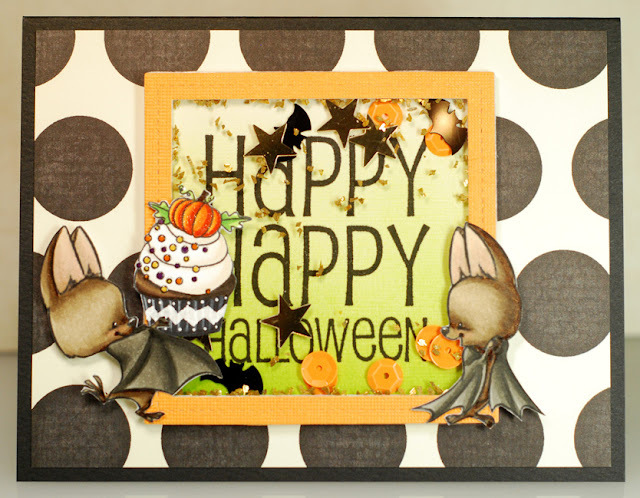 Princess is part of the Peek a Boo set from The Greeting Farm as are the sweet pumpkins that she has floating around her. 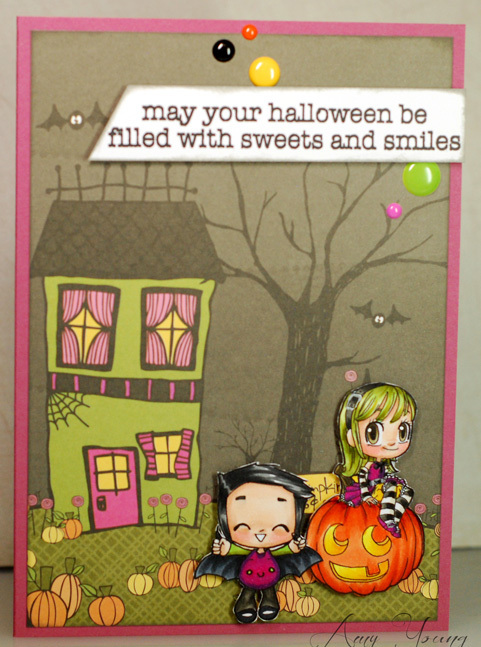 I couldn't help but step away from the traditional Halloween colors for this card because Princess needed pink, LOL! 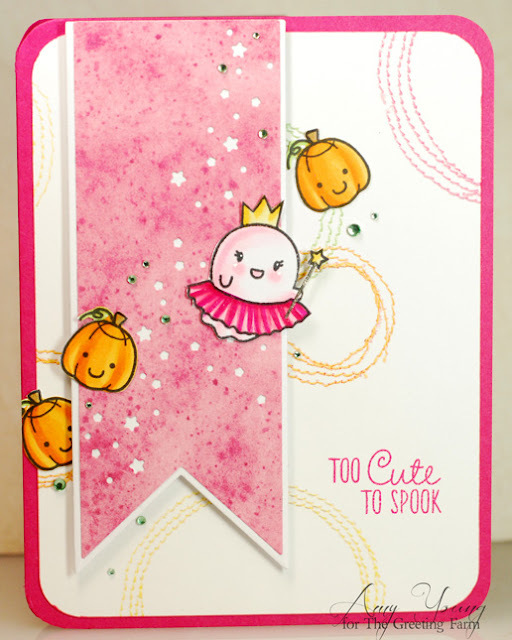 The layout design is pretty simple but I think the cool star sprinkled banner die adds just the right amount of magic for Princess and her jack o'lantern entourage.